Home BUSINESS MTAANI NEWS Kimathi residents want “Right to Buy Kanjo houses” and help government reduce housing deficit. Kimathi residents want “Right to Buy Kanjo houses” and help government reduce housing deficit. Thika Town MP Eng. 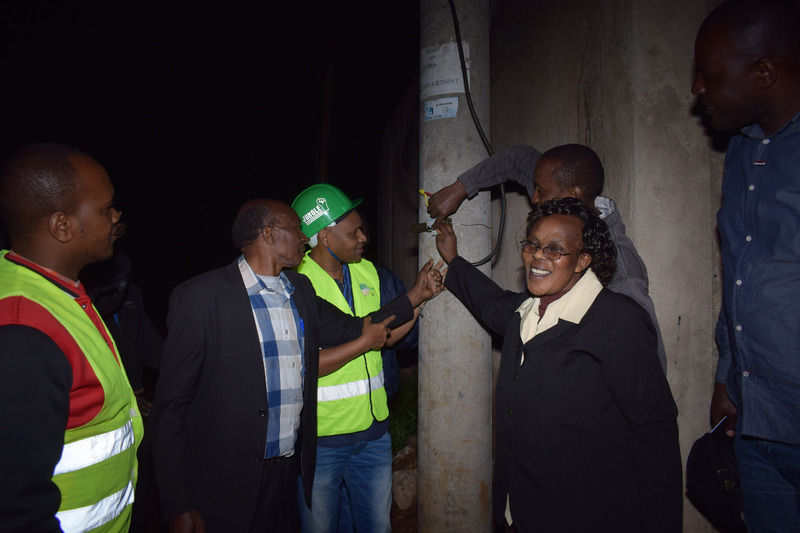 Patrick Wainaina flanked by Kimathi Estate residents while switching on the estate street lights on Tuesday night. More than 100 Kimathi Estate tenants in Thika want the Kiambu government to offer them the opportunity to buy their homes that they have lived in for more than 40 years. While addressing their grievances to Thika Town MP Eng. Patrick Wainaina on Tuesday night as he was commissioning the street lighting programme in the area, the tenants appealed to the devolved unit to sell off these council houses to them through a tenant-purchase scheme that was favourable to them. Joseph Mwaura Gitimu explained about the genesis of this particular endeavour that dates back more than 15 years during the defunct Thika Municipal Council. He says that in all these attempts, they have officially applied for the purchases and also held meetings with the heads of consecutive administrations with the latest one being with the current governor Ferdinand Waititu. Gitimu, who has been a resident of Kimathi Estate for over 20 years says that their first attempt was thwarted by certain councilors who considered them politically unfriendly to the systems and used their minutes to extend a “Sale Order” to Kamenu tenants who eventually bought the then council houses. “We have been applying to buy these houses since the era of the defunct Thika Municipal Council but in vain. Our first attempt was denied on political grounds and our minutes used to extend the same to Kamenu tenants where some of these councilors lived,” he said. “We are now appealing to our MP to help us acquire allotment letters and subsequent building plans in line with President Uhuru Kenyatta’s Affordable Housing Programme under the BIG 4 Agenda,” he added. His sentiments were echoed by Fidelis Wambui Ndirangu who reckoned that Kimathi residents could be the quick link to affordable houses for the residents of Thika. She thanked the area MP for the street lighting programme saying that it was a big step in the fight against crime. “We have been living in darkness for more than 10 years now since the previous lights stalled. We are happy that lighting will enhance security which has been an issue in this estate,” said Wambui. Responding to their grievances, the MP promised to walk their journey by lobbying the necessary assistance whenever he was called upon. He challenged the residents to take advantage of the street lighting and home electrification programmes to promote a 24-hour economy as well as creating more jobs for the youth. He promised to light up all the estates and villages in the entire constituency, calling for patience from all those who were yet to benefit. “We are rolling out this programme to all the corners of Thika Town Constituency and I therefore call for those who are yet to be connected to be patient. This is a personal initiative under the Private-Public Partnership Programme aimed at making Thika more secure and ease business,” explained the MP.